We’d love your help. Let us know what’s wrong with this preview of Bitten by Spain - The Murcian Countryside a Baptism by Fire by Deborah Fletcher. 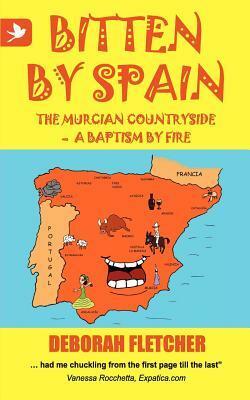 To ask other readers questions about Bitten by Spain - The Murcian Countryside a Baptism by Fire, please sign up. Once in a while you read a book that makes you laugh out loud. Bitten by Spain is hilarious and the kind of book that is difficult to put down. I loved it. The author moved from her ever so sensible existence in the UK to build a new life in Spain and she describes her adventures, warts and all, with a nice, easy-to-read style. The fact that her dogs, cat and parrots joined the fray added some real pathos for me, and when the menagerie is augmented by an assortment of Spanish birds, animals and Once in a while you read a book that makes you laugh out loud. Bitten by Spain is hilarious and the kind of book that is difficult to put down. I loved it. The author moved from her ever so sensible existence in the UK to build a new life in Spain and she describes her adventures, warts and all, with a nice, easy-to-read style. The fact that her dogs, cat and parrots joined the fray added some real pathos for me, and when the menagerie is augmented by an assortment of Spanish birds, animals and creepy-crawlies, the final mix is hilarious. I was struck by Deborah's pluck (her husband was often back in the UK working) and there are some tender and thought provoking moments along with the humour. I couldn't resist including a quote about one of her dogs to demonstrate this. "Stricken, I knelt down by his side....deeply fearful for this great and proud creature, usually so full of bounce and noise, now looking half-dead. I pulled both eyelids up with my thumbs, but his normally-beautiful steely blue eyes, horribly blood-shot rolled upwards to his skull. I stroked his head gently....I dipped my head alongside his mouth, checking for the feel of his breath on my cheek." It really is a lovely read and the kind of book you can dip in and out of (the chapters are a bit like bite-sized set pieces). I actually read it in one long sitting (accompanied by a good bottle of Spanish red). It's a perfect holiday book and I'm sure would be of interest to anyone who has moved abroad, is thinking of doing so or just wants to read a good story told well. I'm dying to know what happened next - so hope there's another book on the way? Was quite interesting... gives u some idea of what the Spanish are like ! Evokes images of olives and wine and mountainous countryside ! Yep not too bad ! I live in Andalucia, in the countryside, and much of what happens to Deborah in this book rings true with my experiences. I read it from start to finish in just over a day, and could not put it down. I would suggest that anyone thinking about moving to live in a rural place in Spain, or anywhere else for that matter reads this. The knowledge you get from it could prove invaluable. It's more about parrots than Spain...and btw...the word 'lech' doesn't have a 't' in it. Self publishing at its worst.